Today we'd like to highlight one designer named Maiko Kuzunishi. She is the owner and designer at Decoylab in Kansas City, Missouri. Her designs are quite impressive. I've selected a few below that really stood out to me. 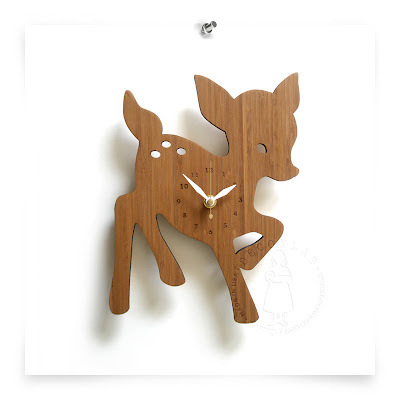 This first one is a clock laser, "Fawn", cut from 3-ply bamboo. I love the soft edges and think it would be a nice addition to a children's room. This next one, "It's My Forest", struck me because of all the intricate detail. The material is not listed, but I assume it is acrylic. The clock is available in black, ivory, orange, and aqua (pictured below). The last two clocks use two different materials in layers. The first uses ivory acrylic layered on top of bamboo. Since laser cutting is primarily a 2D cutting technology, using layers is a good way to give the product depth. In my opinion, the juxtaposition of the acrylic and bamboo gives the product a bit of character. The name of this piece is "Kirie". On the Decoylab website, they explain, "Kerie is a Japanese word for paper cutting and the design is inspired from it, since all images have to be connected in order for laser cutting to curve out the image in once piece." Finally, this "Twinkle" clock makes use of two layers of bamboo that have been laser cut and mounted at an offset on top of each other. A big Inventables hat tip goes out to Maiko Kuzunishi. She is doing some remarkable work with laser cutting and is an inspiration to us all.